Be the first to share your favorite memory, photo or story of Alma. This memorial page is dedicated for family, friends and future generations to celebrate the life of their loved one. Mrs. Alma Lyzen, age 96, of Hull, passed away on Saturday, March 23, 2019, at her residence. There will be a memorial service on Tuesday, March 26, at 11:00am, at the American Reformed Church in Hull. The Rev. Steve Bierly will officiate. Interment will be prior to the service at the Hope Cemetery in Hull. There will be a prayer service for family and caregivers on Tuesday, at 10:00am, at the Oolman Funeral Home in Hull. Visitation with the family will be on Monday, from 5:30pm to 7:30pm, at the funeral home. 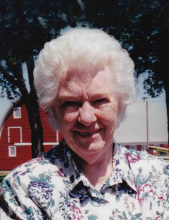 Alma Ruth was born on July 18, 1922, at Sioux Center, the daughter of Henry W. and Henrietta (Schutt) Wesselink. She was raised at Sioux Center, where she was a teacher in a country school for a year. She then attended Central College in Pella for another year. On March 28, 1941, she married Henry John Beyer, Jr., at her parent’s home in Sioux Center. They farmed at Hull. Henry passed away on July 27, 1977, at Hull, after 36 years of marriage. On December 5, 1982, she married Gerrit Lyzen at the Little Brown Church in Nashua. He passed away on May 2, 2000, at Hull, after 17 years of marriage. Alma was a homemaker and assisted at the Hull Public Library. She and both of her husbands enjoyed fishing and gardening. She was very good at solving crossword puzzles. She liked time with her grandchildren and great-grandchildren. In later years, she appreciated the attention she received from her son, “Al”, her granddaughter, Sara, and several other faithful caregivers. Survivors include a son, Alan Beyer, of Hull; a step-son-in-law, Ward “Harry” Andrews, of Alton; two granddaughters and their husbands, Karla and Chris Bailey, of Alcester, South Dakota; and Sara and Harlo Vink, of Hull; three great-grandchildren, Steve Hennigs, and Harley and Karly Vink; and many step-grandchildren and step-great-grandchildren. In addition to her parents and husbands, she was preceded in death by a son, Karl Beyer; a daughter-in-law, Maynel “Jill” Beyer; a step-daughter, Linda Andrews; three sisters and five brothers. Memorials may be directed to the Hull Emergency Medical Technicians. To send flowers or a remembrance gift to the family of Alma R. Lyzen, please visit our Tribute Store. "Email Address" would like to share the life celebration of Alma R. Lyzen. Click on the "link" to go to share a favorite memory or leave a condolence message for the family.